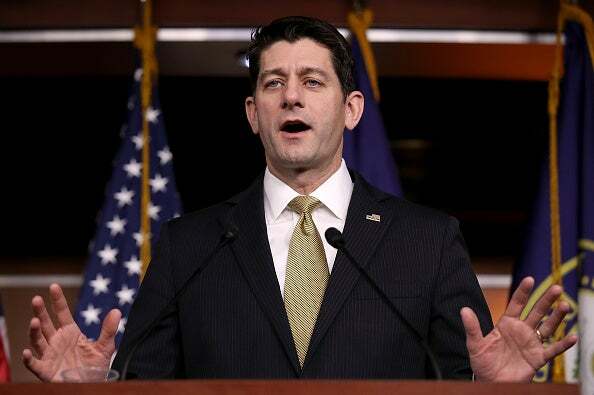 RUSH: Paul Ryan had his press conference today fighting back, finally, on this whole idea that the Republicans want to shut down the government. That the Republicans love shutting down the government, because the Republicans don’t want welfare checks to go out. The Republicans don’t want food stamps to work. The Republicans don’t want the poor to be taken care of because Republicans are mean-spirited and extremist, all this. And usually the Republicans don’t fight be back. They figure there’s nothing they can do, and whenever there’s a government shutdown, they’re gonna get blamed for it. In fact, they have a habit of not fighting back for so long because they’re just resigned to the fact that they’re gonna get blamed, that they end up giving the Democrats everything they want to stop a shutdown from happening. But now there’s a new sheriff in town. His name is Donald Trump, and he’s not putting up with it, and this is inspiring other Republicans to join him on the battlefield. RYAN: They continue to hold military funding hostage over unrelated issues and deadlines that don’t exist. Now they are threatening to shut down the government altogether over these unrelated issues. It is just unconscionable. Our men and women in uniform need our help. They need these resources so they can do their jobs and do it safely. Don’t take my word for it. Here is what Senator Schumer himself said in 2013. Let me read you this quote. This is from Senator Schumer. Quote, “We believe strongly in immigration reform. We could say, ‘We are shutting down the government until you pass immigration reform.’ It would be governmental chaos,” close quote. Chuck Schumer, October 6, 2013. This strategy is “governmental chaos.” I could not agree more. So we’ll see. The deadline is about 36 hours from now, and we’ll see what happens. But we’re on a different road. RUSH: Norm in Worcester, Massachusetts. Great to have you on the EIB Network. Hello. CALLER: Good afternoon, Rush. How are you? RUSH: Just fine. How are you? CALLER: Oh, it’s great to talk with you. We’ve been on the same frequency for over 25 years. I go all the way back to the gurgling cod with Ted Kennedy. RUSH: The gurgling cod. Oh, yeah, that’s my first trip to Boston. I remember that. CALLER: Boston’s a great city. Hey, a couple of things. First of all, you mentioned the book by Bret Baier on Eisenhower, and I’ve been reading that and there’s some analogies to Trump and what Trump’s going through today with Eisenhower. When Eisenhower had his first cabinet meeting, everybody — or, not the cabinet meeting, but meeting with both the Democrats and Republicans. And he brought up some of the issues they talked about during the campaign, and he was told right away, “To hell with that. We’re not interested in what we promised in the campaign. We have an agenda, and this is what we’re gonna do.” And he was shocked. And I think that’s pretty much what Trump is going through. They all committed and promised to border, to taxes; and they didn’t do any of it, until the pressure came on. CALLER: Here’s a great point on the S-hole thing. Whether he said it or not makes no difference. The fact that it was brought out, it was brought out on all liberal networks. It never would have reached there. RUSH: That’s it! He’s exactly right! It shut down the entire Democrat plan with one question and one word. That’s exactly right. RUSH: I have a Trump sound bite on the government shutdown. This was this morning outside the Pentagon. Trump went over there, talked to military leaders, and had this to say. It’s audio sound bite No. 1. THE PRESIDENT: You see what’s happening with respect to jobs. You see what happened yesterday with Apple, and now it was just announced that they’re giving each employee a lot of money. So our tax cuts and our tax reform has turned out to be far greater than anybody ever anticipated, and I’m sure the Democrats would like to blunt that by shutting down government. But again, the group that loses big would be the military. REPORTER: Are you responsible for the government shutdown? THE PRESIDENT: We’ll see what happens. It’s up to the Democrats. RUSH: You hear this little mangy reporter out there? “Mr. President! Mr. President! Are you responsible if there’s a government shutdown? Are you responsible, sir? We hate your guts, by the way, sir. Do you know that? We think you’re a reprobate! We think you’re evil! We wish you would die. We wish you’d get a heart attack like CNN says you’re gonna get. Are you responsible?” “We’ll see what happens. It’s up to the Democrats.” Screw off! With that, we go back to the phones because we got Justin here in Wareham, Massachusetts. You’re next, sir. Great to have you with us. CALLER: Hey, Rush, how are you doing? First time, lifetime. Nice to finally talk with you. I guess I have a two-part question. If… In the event of a government shutdown, what would that mean for the American people? And the second part is, if they want to shut down, what’s stopping us from just saying, “The heck with you?” and hiring someone else to do their job or electing somebody else to do their job? RUSH: The first part of the question is, “Why?” It’s a great question. We’ve been asking the question “Why?” for decades, for the millennia. If we ever stop asking that question, we’re cooked, we’re finished, because “Why?” is how we get our answers. Do men wear shoes? Yes. RUSH: Yeah. See? That’s how it works. Your first question, “What does it mean for the American people?” Absolutely nothing! RUSH: If it weren’t for the media going nuts, you wouldn’t even know that it’s happening. The government technically never does shut down. This is no different than the Christmas recess or the holiday recess or the Easter recess or the ski weekend vacation recess. I mean, people leave Washington all the time. It may be that certain bureaucracies shut down for a while, but they always get their back pay. If anybody loses their money, if any government employee loses money, they always get their back way. The first government shutdown of note was the budget deal of 1995, Justin, and it was Bill Clinton versus Newt Gingrich. The government shut down, and the first thing that happened is CNN found the guy that ran the sleigh ride concession at Yellowstone National Park, and they had him on TV, and the guy was going on and on and on about how he couldn’t stay in business because he ran the sleigh ride concession. If the government was not going to fund and keep the park open, he couldn’t give people sleigh rides and, “Oh, my God, what am I gonna do?” CNN made this guy the face of the government shutdown. Then they focused on bureaucrats who would not receive the Thanksgiving turkey that some of them get free of charge from the government. Well, guess what? The guy at the sleigh ride concession was repaid for whatever he lost. All of those government employees that were shut down got their back pay and their Thanksgiving turkey. It just came later. It really is an exercise in semantics. There have been probably in the last 10 years, 15 government shutdowns. Do you think…? Can you recall anything dire that ever happened? RUSH: Even the one from 1995, can you remember anything bad that affected you when the government shut down? 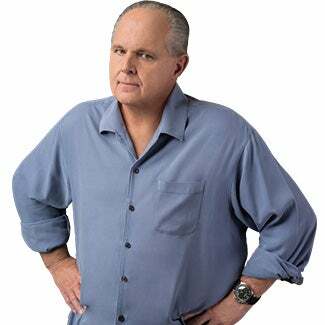 RUSH: It is, in truth, folks, a manufactured construct that really has, in the modern era, its origins in that budget deal of 1995. The reason for that was the Republicans won the House in 1994 for the first time in 40 years, and Bill Clinton was on TV talking about how he was still relevant. Just because the Republicans won didn’t mean he was powerless. And a big, big power fight emerged over this, and Newt Gingrich rolled the dice and insisted on certain things that the president (at the time Clinton) decided to shut down the government over it. It was all manufactured. Now, imagine, Justin, you have a couple of kids that go to school, and there’s a government shutdown; that means the school lunch program is suspended for a couple days. Are you gonna let your kids starve and then you gonna go on TV and blame the Republicans for your kids starving, or are you gonna find a way to feed them? Which is your responsibility in the first place! CALLER: Right. You just send them to school with lunch. RUSH: It’s become an annual, predictable political exercise that is orchestrated by the Democrat Party. And the strength of it, the value of it resides in the fact that the Democrats over the years have convinced more and more people that life cannot be normal with the government shut down. They have convinced people more and more that government is the center of life in America, that government is the heartbeat, that government is the pulse, and without government functioning with proper Democrats in positions of power, the country cannot survive. And it never happens. This is the first time that there is push-back by Republicans on the government shutdown. This is the first time Republicans have gotten aggressive with it, led by Trump, blaming it on the Democrats. It’s never happened, Justin. It’s never… Well, that’s not true. There have been Republicans that have tried to, but they couldn’t break through the noise because they were not president. Trump is president and can cut through the noise, and that’s inspiring Paul Ryan to join him. So their theme now is the Democrats seem to care more about 800,000 foreign children than they do the American military, than they do American kids. This is an aggressive push-back, and I think that it’s working because it’s driving Nancy Pelosi literally nuts. Grab sound bite No. 26. Pelosi had her briefing, her weekly press briefing on Capitol Hill today. She was talking about the continuing budget resolution. Remember, this is because we don’t even have budgets yet. The government is funded with what’s called a CR, continuing resolution, and in this way we’re able to beat spending caps that are in the law because they apply to a budget. A continuing resolution is just members of the House and Senate agreeing to fund the government for another three months or six months or however long they can agree to do it. But it always expires and needs to be done again. And when every continuing resolution expires, and one is expiring Friday, here comes, “The government’s gonna shut down! The government’s gonna shut down!” There have been so many government shutdowns in the last 30 years, and you can’t remember one. I mean “you” generically. Even the ’95 budget deal, you can’t remember, unless you missed the sleigh ride at Jellystone Park. And even after the government shutdown, the Republicans did not lose any seats in Congress. It did not harm them being blamed for shutting down the government. But you can’t convince them. But now there’s a new sheriff in town, things are happening a different way as far as political messaging, and listen to this. And they say Trump’s losing his mind, they say Trump’s borderline Alzheimer’s, dementia. Tell me what this is. RUSH: Okay, so here’s Pelosi talking about a bowl of excrement with a cherry on top, a bowl of doggie doo, put a cherry on top, call it a chocolate sundae, that’s what the Republicans are offering here. This is nothing. This is nothing. You know the CHIP, this should have been done in September, first of all. It was. And it’s expiring. And I don’t even know what CHIP — (interruption) Yeah, there’s a children’s health program that is funded, by the way, with tobacco taxes. I don’t know if that’s the acronym for it. It’s close. She may not know what she’s talking about is the point. I’m sure she knows what a bowl of doggie doo is. Sees enough of that in San Francisco every day. RUSH: So basically what you have here, led by President Trump, is an anti-shutdown message, blaming the Democrats for it. And the message is Democrats are putting 800,000 illegal immigrants ahead of active duty military members. That’s what this is about. That is essentially what Paul Ryan was saying in his press conference just before noon. That’s what Trump said outside the Pentagon today when he went over to the military. And every Republican from now ’til the end of this battle over this continuing resolution needs to say the same thing, be on message. But that’s the message. That’s what the Democrats want. And they’ve always gotten their way up ’til now. They’re holding national security hostage, potentially costing the economy billions of dollars. They’re forcing hundreds of thousands of precious federal government employees to go without pay. They are disrespecting the U.S. military, all of that in exchange for securing legal protections for 800,000 illegal immigrants, but potential Democrat voters. That needs to be the way they cast this. And Trump is doing it. Folks, again, the government doesn’t really shut down. Not the way the word implies. It does not close. Entitlement checks or deposits continue. There’s not a welfare recipient out there that will not get his welfare. There’s not a food stamp recipient that will not get his debit card. There’s not a Social Security recipient who will not get their check. There’s not one interruption to any entitlement payment to anybody. They do not lock the government, and it does not cease operations. The president gets up and goes to work and the House and Senate will get up and go to work. It’s a political construct created by the Democrats, aided and abetted and amplified by the media, to try to demonstrate Republicans hate government and hate all that government does for people. And only government does things for people in the Democrat world. And so when government shuts down, people are hurt. When government shuts down, people are in pain. When government shuts down, people are locked out of resources and benefits. And that is the lying, stinking political message that the Democrats and the media promulgate, that the Republicans heretofore have felt there was no way they could beat it back. There was no way they could overcome it, so they had to acquiesce to it. That day apparently is over. We shall see.